"The world might have been ordered differently. Suppose, for example, that one or several species of our ancestral genus Australopithecus had survived—a perfectly reasonable scenario in theory, since new species arise by splitting off from old ones (with ancestors usually surviving, at least for a time), not by the wholesale transformation of ancestors to descendants. We—that is, Homo sapiens—would have faced all the moral dilemmas involved in treating a human species of distinctly inferior mental capacity. What would we have done with them—slavery? extirpation? coexistence? menial labor? reservations? zoos?" "If you compare humans with other humans today, we differ by about one base pair out of a thousand. So, we’re between ten and twenty times more similar to each other, compared to what we are with chimpanzees. So, if you think about this in terms of years, we think that we divided from chimpanzees—our population split from them something like five-million years ago. Well, that means that humans, on average—two human genes split from each other, in ancestry, something like 500,000 years ago. If you look at us and Neandertals, they’re different from us by just a shade more than we’re different from each other, so that if you compare their genes and our genes, it looks like about maybe 800,000 years is the average. 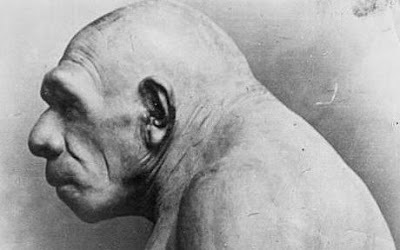 However, that’s recent enough that there are some human genes for which two human copies taken at random are more different from each other than one of them is from the Neandertal." This data would seem to suggest a genetic distance spectrum from Europeans to Neandertals with Africans closest to the Neandertals. That is an erroneous conclusion. This data made use of a reference human genome consisting of the DNA of an African-American who is genetically 50% white and 50% African. The numbers are composite autosomal divergences. For the European regions of autosomal DNA, shown below, the values are similar. However, the Neandertal divergence is slightly less, in accordance with the conclusion that Neandertals and non-Africans share 13 regions of DNA or an average of 2% of DNA from mixing. The data for the African regions of autosomal DNA, below, look far more confusing. The Yoruban individual was actually not significantly closer to the African regions of DNA than the European regions, and the San person was even slightly (not significantly) closer to the European regions. Africa is the most genetically diverse region of the world. Perhaps its wealth of genetic diversity provided for such a manifestation of Lewontin’s fallacy. Part of what makes this revelation so fascinating is its challenge to politically correct notions of race and the out-of-Africa anthropological model. Indeed, Green et al cite an estimate by Wall et al that non-Africans have 14% archaic ancestry. The implication is that the remainder of this archaic ancestry came from some other ancient primate population. Equally intriguing is how Green et al inadvertently pits a traditional anthropocentrism against taboo, but perhaps commonly held, views of racial supremacy. Now, one should not consider the evidence of intimate relations between Neandertals and the ancestors of non-Africans a comeuppance. Obviously, "neanderthal" became an epithet on par with "cretin" or "jerk." 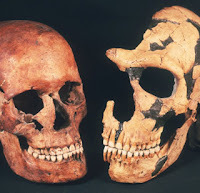 On Razib Khan’s blog, one of the many co-authors of Green et al saw fit to defend Neandertals. "… I see no reason to think that they were not as smart as us." Suppose the Neandertals were in some meaningful sense an inferior race. At least in a Darwinian sense, leaving a mere 1-to-4% of their genome is an underwhelming legacy. (Actually, Hawks says that each non-African has a different makeup of Neandertal DNA, and Green et al found that when the reference genome European regions were closest to Neandertal DNA, they diverged from the genome of Craig Venter, who is of European descent. Therefore, it is unclear to me exactly what percentage of Neandertal DNA collectively exists today in humans. Plus, Hawks thinks that it is still possible that Africans also have some Neandertal DNA that the study could not detect. 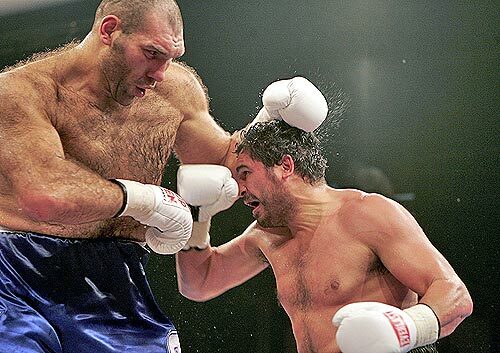 That would result in a higher calculation of Neandertal ancestry for both Africans and non-Africans.) Even such a small percentage is a sufficient legacy to discredit the neurotic meme of racial supremacists/nationalists/separatists that impurity is abominable. Many possibilities could explain why so little Neandertal DNA remains in humanity, including natural selection. 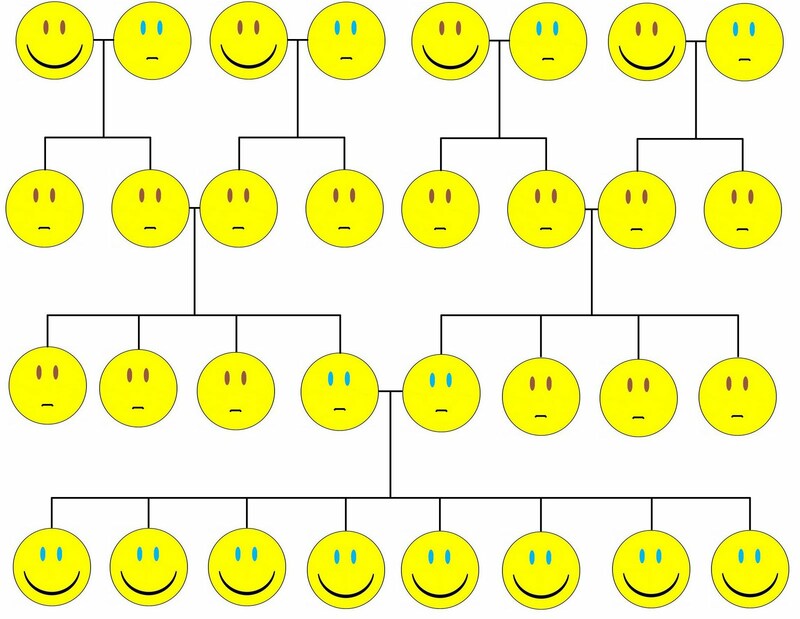 This leads to one useful argument against the supremacist meme: a Mendelian model. White supremacists obsess over the dominance of certain phenotypes. Therefore, imagine that a population of brown-eyed individuals completely pair off with a population of blue-eyed individuals, and assume brown eyes are a phenotype with Mendelian complete dominance. There. In a single generation, all blue-eyed people vanish. But don’t cry, because they all passed their DNA onto a generation of brown-eyed heterozygotes. Statistically, about a quarter of the third generation will have blue eyes. Since blue eyes are so superior to brown, the forth generation will consist entirely of the blue-eyed. Natural selection depends upon context or environment, which leads to a second argument, that of the inevitability of change. Skin color is a perfect example of environmental adaptation. The genes that influence human skin tone appear to be relatively few, and skin-expressed genes comprised the most common genetic differences between modern humans and Neandertals. If white people lost the ability to attain sufficient dietary folic acid, those who live in sunny climates would probably gradually evolve darker, melanin-pigmented skin. Even an otherwise inferior race of Neandertals could have had adaptations to the colder environs that they inhabited. Mixing and millennia may have allowed the non-Africans to absorb such advantages without ultimately losing advantageous African phenotypes. One counterargument to consider is that holding off on mixing or preserving a differentiating subspecies could allow for further differentiation of some possible value. The process of natural selection is not teleological. Rather, evolution proceeds in whichever direction is immediately advantageous. Genetic separation helps to create a diversity of abilities and biological strategies. Moreover, often evolving in a distant environment leads to adaptations with nearly universal applicability. Just ask the brown tree snake, which immigrated to and now overruns the island of Guam, causing millions of dollars in damages each year. Invasive species cause damages in the United States worth $120 billion annually. Animal predators as invasive species can devastate an ecosystem. However, a study by Sax and Gaines found that plant invasions of island ecosystems have actually doubled the amount of species diversity. Likewise, when two human populations come in contact, a gradient of mixing can result that creates a more complex form of diversity. Of course, it is hard to argue that leaving tiny segments of their DNA in the human genome was an adequate hedge against extinction for Neandertals. In fact, Harvard geneticist George Church hopes to bring them back from the dead. Nevertheless, the process of evolution did somehow work against these beings. The ethics and logistics of humanity guiding its own evolution receives surprisingly little analysis either from the scientists who might develop new means or from racialists who might possess the will. With as much impact as humans have on the environment, of course they can shape the forces of evolution, but evolution will never stop. Even with the sprawling health care industry presumably treating hyperlipidemia and hypertension, humans are evolving to have lower cholesterol and systolic blood pressure, according to a recent study by Byars et al. The fact that humans are also evolving to be shorter and fatter may beg the label "dysgenics." However, such oversimplification flies in the face of a study by evolutionary psychologist Satoshi Kanazawa. He found that very liberal individuals have a nearly 12-IQ-point advantage and that atheists have a 6-IQ-point advantage. Monogamous men, but not women, have an IQ advantage, and that says it all. IQ allows one to overcome instinct. Liberal inclinations and abandonment of traditional beliefs can often come with personal costs. Liberals might sacrifice to help unrelated poor people. Atheists might miss opportunities for fellowship. 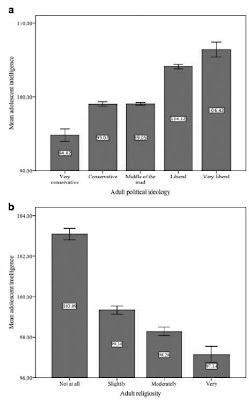 Rather than higher IQ proving the evolutionary superiority of liberals and atheists, these associations may suggest that some height of IQ reduces biological fitness. However expedient blaming the welfare state for the apparent plateau of the Flynn effect in industrialized societies may seem, the context in which high IQ is actually genetically beneficial may be more limited than one might intuit. The true meaning of the new understanding of Neandertals is that race is simultaneously more real and less important than the previous paradigm led some to believe. Racial purity is neither necessary nor sufficient to preserve the qualities by which some judge races, civilizations, and individuals. Those qualities would include intelligence, peaceableness, functional family values, productivity, and so forth. Nevertheless, race-realism has an important place in modern intellectual thought not only because race is real, but also because leftists have used racial disparities to discount these qualities and to discount the role of genetics in the formation of those qualities. Still, preserving human exceptionalism from fading into the background of natural selection is a cause more extreme and more just than the fancy to preserve any race. "Even such a small percentage is a sufficient legacy to discredit the neurotic meme of racial supremacists/nationalists/separatists that impurity is abominable. " If you aim for "purity", you'll get "good enough". If you aim for "good enough", you'll get Brazil. There's nothing neurotic about valuing racial "purity". The point of racial preservation is not to preserve blue eyes or blond hair. It's to preserve populations. A diversity of hair and eye colors is merely one external manifestation of the the genetic variation in the group Northwestern European preservationsists seek to conserve. A blond or blue-eyed mulatto is not a Swede, and the existence of such bizarre mixes would not render the prospect of the extinction of Northwestern Europeans tolerable. The presence of ancient Neanderthal admixture in modern humans bears little on the question of racial preservation today, and to the extent it matters at all it's a blow against the orthodoxy of complete African replacement as a retarded argument in favor of the impossibility of racial differences that's been pushed over the past couple of decades. One's interests lie in the preservation and propagation of self, kin, and group. A focus on "preserving human exceptionalism" at the expense of one's own race would seem to fall into the category of allowing IQ to override instinct. Of course the selective environment matters in the maintenance of racial characteristics in the long run, but in America right now 2/3 of the decline in IQ is being caused by differential population growth between races. There's also evidence natural selection is less efficient in highly admixed populations, and Cochran and Harpending have pointed out that the amount of admixture necessary for the introgression of any beneficial alleles is absolutely minuscule. If you aim for "purity", you'll get "good enough". If you aim for "good enough", you'll get Brazil. Okay, but, as they say, the perfect is the enemy of the good. If you aim for racial separatism, you’ll get a lost cause and banishment. If you aim for racial nationalism, you’ll probably get racial violence. I want a fundamental strategy shift for race realists from hoping for the decline of our civilization in order to return to traditional ideas of race to a strategy of relying on scientific progress to prove racial differences, such that elites can carefully consider the implications, and brushing off mixing as a matter for evolution to sort out. A blond or blue-eyed mulatto is not a Swede, and the existence of such bizarre mixes would not render the prospect of the extinction of Northwestern Europeans tolerable. Well, a Swede may choose to have children with another Swede. A Swede can even express disapproval if their children marry non-Swedes. The question is: How far can a Swede go to prevent other Swedes from having children with non-Swedes? This is not just a moral question; it is also a question of means, pragmatism, and realism. There is also the dilemma of how to dispose of those existing “bizarre mixes.” Your problems will multiply as you try to sort out the definition of intolerable mixing on a global scale. You are trying to prevent change within an evolving species. A focus on "preserving human exceptionalism" at the expense of one's own race would seem to fall into the category of allowing IQ to override instinct. Preserving IQ does not have to be at the expense of race. You are using the term “instinct” loosely. Attraction is instinctive, and virtues like intelligence can be attractive. I suppose you meant it in the limited sense of the instinctive desire to remain with one’s group, but if that were such a strong instinct, then mixing would not be an issue. Well, thank you for the source. This is one of the few challenges that I have received on the actual science. However, the study, Johnson et al, does not exactly contradict my essay, and it concedes many important points. The major point seems convoluted or of questionable relevance to my essay. The study concedes “that hybrid vigor during the first few generations facilitated the establishment of this hybrid swarm,” but does not see survival benefit to mixing after twenty generations. Twenty generations might not represent the longer-term evolutionary trends, just as the first few generations does not represent twenty. With regard to specific advantageous traits, the study seems to contradict itself, but perhaps I am misunderstanding it. First, it claims there are no fixed nonnative alleles, citing Fitzpatrick et al. While there have been many generations of admixture in the heart of the Salinas Valley hybrid swarm, there has not been enough time for any nonnative allele to become fixed throughout the range of the native species. Our most striking result is that native alleles have been completely replaced by introduced alleles at one marker in our five study sites, and that two other markers are not far behind. However, it is important to point out that the inferred impotence of selection in this system is not absolute. For example, Fitzpatrick et al. show that a few presumably advantageous introduced alleles have become fixed both within the hybrid swarm and in populations far from the Salinas Valley introduction sites. Thus adaptive evolution through gene exchange is happening in this system, but so far has done little to improve mean fitness in highly admixed populations. 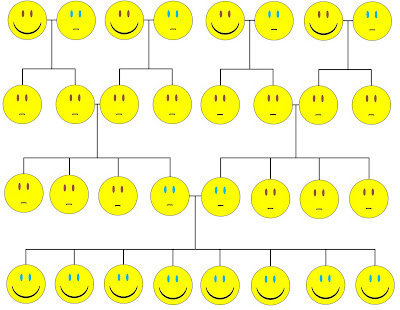 So, natural selection works, but it is not very efficient after twenty generations. Perhaps if all of the specific alleles had stronger selection effects, their fixation would be more uniform. This does not necessarily contradict my thesis. I was not declaring all mixing productive of hybrid vigor with inevitable fixation. I acknowledge a role for natural selection to ameliorate the dysgenic affects of mixing. To say that natural selection is not powerful enough to help those hybrid traits overwhelm the parent populations would actually make mixing less of a threat to those populations. If I am to take for granted that mixing overwhelmed those populations, but maladaptive traits did not hinder survival, I would tend to question just how maladaptive those traits should be considered. The other issue is how applicable this is to human races. This relates to regression to the mean. I mentioned on the blog Cordelia for Lear that population substructure is a non-trivial issue for regression to the mean. Given how much attention it receives from race realists, I was shocked at how apparently little evidence exists for racial regression to the mean. In a 2008 paper, Rushton and Jensen reached back to a 1973 study to defend regression to the mean of races. It was a sibling IQ study, and Jensen pointed out in 1973 that “similar regression would be expected between parents and children, but there are no adequate cross-racial studies of this for IQ." Ashkenazi Jews have very high IQ despite their 30 percent European admixture. Indian immigrants who work in the American high-technology industry do not seem to have much less intelligent children, as far as I can tell. I think non-additive variance would be highly dependent on the nature of the populations under consideration. Needless to say, humans are not salamanders. Cochran and Harpending have pointed out that the amount of admixture necessary for the introgression of any beneficial alleles is absolutely minuscule. Well, Johnson et al seemed to say that “lower levels” of admixture are ideal. Lower levels of gene exchange might be more efficient at introducing adaptive genotypes into populations. That does not sound like a call for purity. If we aim for purity, will we also be hoping for impurity? "I want a fundamental strategy shift for race realists from hoping for the decline of our civilization in order to return to traditional ideas of race to a strategy of relying on scientific progress to prove racial differences, such that elites can carefully consider the implications"
"Elites" are pursuing their own narrow (financial/political/ethnic) interests, and depending on which "elite" we're talking about, the long-term implications of their policies are either irrelevant to them or part of the desired end (if not the entire point). Informing them that non-whites are not going to magically become like whites will not bring about any sudden epiphanies or 180s in policy. The final two paragraphs of this Economist article illustrate how effortlessly elite opinion makers intend to disregard any "awkward" scientific results. The fundamental shift we need is in morality. White elites pursuing personal gain at the expense of the long-term survival prospects of whites need to be shamed and punished, and non-white elites need to be viewed as the outgroup members they are. "brushing off mixing as a matter for evolution to sort out." There's nothing "natural" about the circumstances under which mixing is now occurring. Our present immigration system represents humans taking a hand in evolution every bit as large as (probably much larger than) a state-mandated eugenics program would represent -- nevermind mere immigration restriction. Affirmative action, media indoctrination, federally-enforced school desegregation and bussing, anti-discrimination laws in housing and employment -- these too actively serve to increase mixing. Furthermore, the American government redistributes the resources of whites to subsidize reproduction of non-whites (in the form of free or subsidized medical care, schooling, tax credits, home loans, etc. ), further actively meddling in human evolution. I find the idea that it is somehow less moral to restrict gene flow to levels more in keeping with those found throughout almost the entirety of our evolutionary history bizarre. It seems to me nothing could be more moral than putting an end to our present short-sighted recklessness. "Preserving IQ does not have to be at the expense of race." So why are you talking about doing so and what policies do you have in mind? And what is your ethnic background if you don't mind my asking? I recall reading an interview of Arthur Jensen by Chris Langan many years ago in which Jensen basically said he could be sanguine about the dysgenic decline and mongrelization of the West as long as there would be Mongoloids around in Asia to play Mozart centuries hence. This is an incredibly unhealthy and maladaptive way of thinking. To refine the point I was making, valuing any abstract concept like "civilization" or IQ over the existence of one's own people is maladaptive. Evolved instincts may be maladaptive under modern conditions, as well. At present, we see intelligent whites more often than not overriding their instincts in ultimately detrimental directions, but this need not be the case. "The other issue is how applicable this is to human races." See the Iceland study, which found the greatest fitness among offspring of something like second-cousin marriages. "If we aim for purity, will we also be hoping for impurity?" A small amount of gene flow (more than enough to capture any dramatically fitness-boosting alleles over evolutionary time) is almost inevitable, but I think it matters little one way or the other. What is being selected for matters much more than the presence or absence of that particular source of genetic variants. Anyway, my concern right now is the next hundred years, not the next thousand. The elites of whom I speak are, first and foremost, the scientists. Science does have a knack for transforming the worldviews of other elites, as well. To the extent that this has not been completely true owes much to the horrors of the Holocaust and nazi experimentation. I think the Stephen Jay Gould quotation shows the tenuousness of political correctness when its assumptions are disproved. It is unfair for you to judge the potential of race realism when the science has not had sufficient time to develop, and many of the proponents of race realism have not been upstanding moral actors with clear moral ends. If the face of race realism is David Duke disputing gas chambers, race realism will suffer, but only the worst in the mainstream media would attack Kathy Albain for describing the racial biology of cancer. Many "elite opinion makers," as you describe them, are suffering tremendous readership declines. White elites pursuing personal gain at the expense of the long-term survival prospects of whites need to be shamed and punished, and non-white elites need to be viewed as the outgroup members they are. If you advocate terrorism to accomplish your agenda, I think you will succeed in preventing your agenda. David Lane is dead. There's nothing "natural" about the circumstances under which mixing is now occurring. That is true if the distinction between the natural and the artificial is biologically meaningful. One can make that case quite well, and the circumstances are certainly unprecedented. I am surprised that I cannot find a white nationalist who is a Luddite against airliners. Affirmative action, media indoctrination, federally-enforced school desegregation and bussing, anti-discrimination laws in housing and employment -- these too actively serve to increase mixing. Most of those policies also bother me. I do not advocate mixing, but I do not really fear it. Partly this is because the virtuous can recognize virtue. If a black man fits a negative stereotype and still attracts a white woman, that woman is probably low class. Mixing would also render many of those policies obsolete because racial labels would become arbitrary or fall into disuse. Eurasians will probably feel less responsible for black marginalization that whites will, yet many prejudices will survive in some form just as they do in Brazil. If science can identify the molecular causes of black violence and stupidity and remedy it, then I see little cause for racism. Nevertheless, mixing might be more destructive to America’s black population than anything else. I suspect that black people with more European ancestry are better educated and have fewer children. Modern mixing for black people is primarily a guy thing with black women suffering a tremendous disadvantage. Therefore, black genes disappear more with greater integration. So why are you talking about doing so and what policies do you have in mind? I only wrote that sentence to state the obvious. If a white person chooses to not mix with black people because he or she sees them as less intelligent, both IQ and white ancestry are preserved. However, many people come in contact intelligent people of different races as they progress educationally and professionally. Those people might mix and preserve IQ at the expense of racial purity. I would favor policies that favor the proliferation of virtuous traits, such as allowing young professional women an opportunity to start a family before becoming completely established or extending mandatory minimum sentences for violent criminals. Race realism is a necessary stand for those of us who believe in virtues because those who do not accept the existence of intelligence, peaceableness, or genetic components to such qualities will point to racial disparities to undermine those values. It might bother you that some would adhere to certain race-realist truths without supporting your more radical agenda of racial intolerance, but that does not make me more of an enemy to you than the vast majority of Americans who oppose your agenda. And what is your ethnic background if you don't mind my asking? I am a white Nordic American. A small amount of gene flow (more than enough to capture any dramatically fitness-boosting alleles over evolutionary time) is almost inevitable, but I think it matters little one way or the other. What is being selected for matters much more than the presence or absence of that particular source of genetic variants. By saying that you are setting yourself apart from the majority of white nationalists. You are clearly smart enough to see that I am at least partly right about the science. I tend to think that the difference between us on basic assumptions is just a matter of degree. Perhaps there is a happy medium between appeals to elite thought and the pressure of a declining economy for promoting a populist version of race realism. Anyway, my concern right now is the next hundred years, not the next thousand. This is the crux of our differences. We have to commit philosophy to evaluate the rightness of our own motivations. Do you see yourself as living on as a ghost, watching the fruits of your actions in the afterlife? Do you believe in reincarnation—limited to rebirth within the race, of course? Or do you simply care about your immediate descendants—so much so that you would disown them if they married outside the flock?! I am struggling with a different hundred-year dilemma: I am naturally inclined toward conservatism due to my white identity and Western values, but I have to reconcile that with my understanding that global warming, a supposedly left-wing scientific truth, likely will be more consequential. I am also naturally pessimistic, which leads me to think that human virtues like intelligence cannot withstand a natural selection headwind. Perhaps the future will only offer harbor to the virtue of obvious physical beauty. If that would be the case, I would need to struggle to care about the next hundred years or the next thousand years. Civilization is a word that is righteous and racist, but not race-specific. To refine the point I was making, valuing any abstract concept like "civilization" or IQ over the existence of one's own people is maladaptive. I am a conscious human being. I am not just a piece of junk-DNA ALU repeats. If you want me to contemplate existence after my own existence comes to an end, you have to discuss something more meaningful than spreading my own DNA as much as possible. Since you recognize a distinction between natural and artificial, you might be amenable to the notion that, for the environment, humanity is like an infectious disease or a metastasis. Humanity’s virtuoso adaptability may have created a population-size bubble. I care about all suffering, but such feelings are easily overwhelmed and prone to compassion-fatigue. It is only human virtue that saves me from apathy. The scientific evidence that racial differences in IQ and personality in all likelihood have strong genetic components already exists, and the drive by Jewish scientists to suppress hereditarian thought and deny racial differences predates the coming to power of the Nazis. WWII did play a role in shifting wider scientific opinion on race, but there's no reason it should have. Blank-slatist communists, after all, have been responsible for more deaths. Again, it comes down to questions of (alleged) morality. "If you advocate terrorism to accomplish your agenda"
At present, costs are imposed on those who advocate for white interests and benefits accrue to those who advocate against. I'm pointing out these incentives must be reversed before any real change will occur. I have in mind shifts in public opinion and behavior, not "terrorism". "I am a white Nordic American." Not by any chance married to an Asian? Anyway, I don't consider you an enemy. I do think you're misguided. Would you argue someone should cease to care about his own children and open his house to someone else's children because the other children are more intelligent or better behaved? Emerson says of the gentleman that the first requisite is to be a good animal, and this is the first requisite for every one. A course of life which sacrifices the animal, though it may be defensible under special conditions is not defensible as a general policy. 1) Since the iceages, Euroman was selected as a frontier subspecies to the point he has demonstrated his exceptional potential to bring life to the stars, 2) Euroman, hence the entire family of life, is in danger of extinction because alien influnces have taken over his societies, inhibiting his natural—genetically endowed—expression of his frontierism, turning his powers inward toward the destruction of himself and the planet. ecosystems and not about the creation of others. The scientific evidence that racial differences in IQ and personality in all likelihood have strong genetic components already exists, and the drive by Jewish scientists to suppress hereditarian thought and deny racial differences predates the coming to power of the Nazis. Maybe I have come across the true missing piece in your worldview, if I may be so bold. You apparently do not agree with my view that we are just seeing the beginning of a new zeitgeist of a genetics era. I suspect that you take at face value how prominent geneticists try to minimize genetic differences, especially those between races/ethnic groups. The true context is that prominent geneticists must minimize the political implications of their research in order to maintain funding and dispel potential comparisons with nazi eugenics. Some of the statistical arguments against race are so transparently misleading that it is undeniable that the purveyors are secret race realists. Major regional papers around the country are printing Nicolas Wade’s New York Times story about Tibetan rapid evolution, just as they did five years ago when Bruce Lahn thought he had stumbled upon the IQ gene. Jews do not control the zeitgeist. Liberal elites can remain on the most liberal end of the mainstream spectrum, but they cannot prevent that spectrum from shifting. I would compare it to a radio talk show host who must respond to news events rather than talk about what most interests him or a US president who must respond to events in the country rather than simply set a national agenda or single-handedly improve the national economy. In your view, the next frontier is space. I am skeptical that space colonization will be financially or technologically realistic or desirable, but I am more certain that it is not the defining technology of the era we are currently entering. If we are entering an era in which genetics not only informs our understanding of who we are but also transforms our way of life and the extent and quality of our lives, then genetics will become a spiritual cause. Views inconsistent with a respect for the existence of genetic differences will become anachronistic, and elite opinion will bend to a steady stream of shocking findings that trickle into our newspapers and Drudge headlines, no matter how far down newspaper circulations fall. At present, costs are imposed on those who advocate for white interests and benefits accrue to those who advocate against. I'm pointing out these incentives must be reversed before any real change will occur. Not by any chance married to an Asian? I do not wish to give clues to help people figure out my identity. I should be allowed the freedom to express unorthodox opinions without fear of losing my livelihood or have harm come to my family. Such freedom does not exist in America. Would you argue someone should cease to care about his own children and open his house to someone else's children because the other children are more intelligent or better behaved? No, once a child is born, a parent should do everything reasonable to responsibly care for that child, but I would admire a person who had the consciousness of mind to recognize undesirable genetic qualities within him- or herself and choose to adopt rather than have children. Unfortunately, such people tend to be intelligent, and I think intelligent people tend to be more self-conscious. A positive eugenics, like that which Darwin advocated, or even a voluntary negative eugenics, does not have to imply that “inferiority” is base. One can respect oneself even while recognizing one’s flaws, especially if those flaws are out of one’s control. Would you suggest that a white man with Huntington’s disease should have plenty of children? I would say that people considering adoption should consider the child’s potential. Adopting a girl from a Chinese orphanage will probably do more to unlock human potential than most other kinds of adoption. It is suggested that it would be inconsistent to be concerned about the maintenance of some ecosystems and not about the creation of others. Wow! What a great summary of my original essay in support of propagating virtue rather than concerning oneself with the maintenance of racial purity! I guess you see no contradiction in preserving white tradition or sensibilities while forsaking the Earthling lifestyle. If something as relatively mundane as the Internet can redefine stealing, living an entire lifespan in a moon colony would probably create culture differences that you would find foreign. Do we want to preserve the best features of the white race; or do we wish to preserve whites per se? As far as IQ and fitness goes, it seems to me that IQ is very good for fitness, but this is obscured by the fact that the vast majority of the population is not especially interested in making lots of babies. The world will surely be inherited by people who (1) want lots and lots of children; and (2) pass this desire on to their children. Among these people, intelligence is arguably an advantage. It takes intelligence and planning to raise 8 to 10 children and indoctrinate all of them into your fertility cult. Anyone who actually believed in the Dobzhansky/Mayer definition of biological species would have to conclude that H. neandertalis is not a good species. Neandertals must be a race of H. sapiens. Also, what possible relevance to species' identification is the percentage of common genes? We have a very large percentage of common genes with bacteria. The crux of the matter is the Hox Box. It is differences in the Hox Box that determine species. Where is the data on Hox Box differences?